All merchandise is now available from The Staffie Café! Please understand that some of our merchandise is only offered EXCLUSIVELY to members of our Friends Scheme. Credit Card payments can be made using the secure payment buttons on the items available via this method. We are also able to accept payment via Paypal please email bob@sbtrescue.org.uk for further details including the items you are interested in. Once again we have produced our very own calendar for 2019 featuring some of the rescue Staffords photographed over the past year and this year we have joined forces with NISTBR. 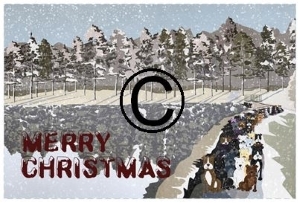 This one features Molly, Stella, Lola, Reggie, Molly, Pearl, Zed, Lucy, Kirsty, Mac, Bart & Stanley. This calendar will tell you why each of these dogs came into Rescue and because of your support for projects just like this how we were able to save them and turn their precious lives around. The calendar is in colour, spiral bound and printed on a high quality A4 gloss art paper and we feel that it is a huge improvement on the mass produced commercial versions. See the results of the work we do and support everyday.Please note we have only ordered 250 of the Calendars this year so don't miss out. Please state what the order is for when ordering. Please send payment to the link below. Although Steve Stone's name sits on the cover, authors from around the world lend this book and its accompanying CD-ROM not only length and breadth but substance. 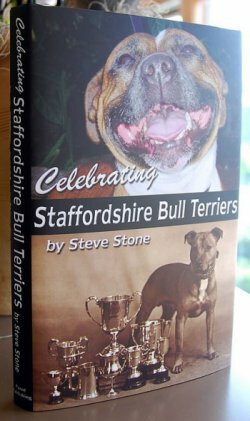 This book not only celebrates the proud history and sheer versatility of the Breed, every word on every page is devoted exclusively to the cause of the Stafford, including the problems encountered by Breed Rescue and the menace of Breed Specific Legislation (BSL) which mindless politicians seem intent on imposing on the dog-loving public in the face of overwhelming evidence of its ineffectiveness. Contents: The True Nature of the Stafford (public Stafford, private Stafford) • Following the Ancestral Trail • A Stafford Renaissance (by Vic Pounds) • Veterans’ Views (Staffords come into their own) • The Stafford Athlete (More than just a pretty face!) • A Foremost All-Purpose Dog (You name it and Staffords can do it!) • Breed Standard Variations • Breeding Principles and Practices • Quo Vadis, Mrs. Stafford? (Pathways to the breed’s future) • Stafford Rescue (The high price of Breed popularity) • Birth of the BSL Blues • Seizing BSL by the Throat • Snips and Snails and Staffordshire Tales (Stafford anecdotes). Additional Content: A free CD-ROM attached to this 256 page book contains more than 300 pages featuring hundreds of full-colour photographs from every nation around the globe where Staffords have become firmly established away from the Breed's UK heartland. Additional bonus material also appears within the disc's contents. Steve Stone imported Finland's first Stafford in April 1964 and was co-founder of the SBT Club of Finland. Returning to the USA in 1966, Steve founded the SBTC/USA and Registry 1967, beginning the drive for entry into the AKC. Please order now to avoid dissapointment. Prices below include postage costs. Our fashionable Charity wristbands are now available. Registered Charity Number 1111698. 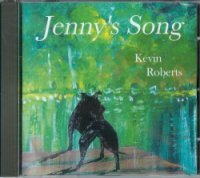 This beautiful CD sung from the heart by Kevin Roberts is a must for all Staffordshire Bull Terrier lovers and in fact all dog lovers. 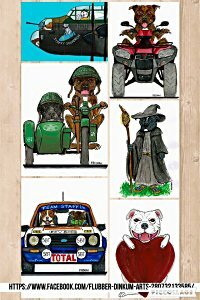 Northern SBT Rescue's wonderful Get Well card designed by our very own Cliff Logan. This would be I'm sure be a welcome Get Well Message for many Staffordshire Bull Terrier Enthusiasts. Please check for stock before ordering. 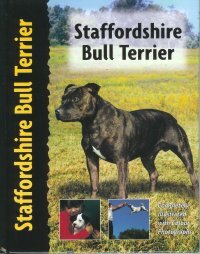 This book provides the much-needed factual information about Staffordshire Bull Terriers and their ancestry, character and standard, as well as the proper selection, feeding, training, preventative health care and behaviour of the breed. With scores of beautiful photographs (some by and some even featuring Tony “Now, where’s me keys” George) this is an essential addition to the library of every Staffordshire Bull Terrier enthusiast. 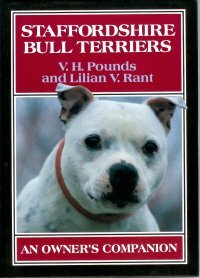 By Vic Pounds & Lilian RantThis is one of the definitive books on the breed and written by two of its pioneers. Vic Pounds is also credited with being the founder of the first Staffordshire Bull Terrier Rescue as well as considerable success in the show ring and a leading international judge. This hardback book is well illustrated with black and white photographs and line drawings. A complete guide to the Staffordshire Bull Terrier that will be of interest not only to the new owner but also to experienced breeders and enthusiasts. 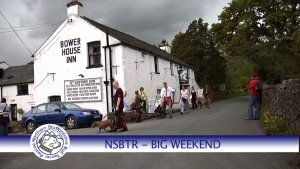 A professional documentary with excellent footage and interviews at the annual Staffordshire Bull Terrier Rescue Walk in Eskdale 2009.